PSK31 is a data mode. You need to connect your radio to a computer to get this to work. Once connected, you can have a real-time text-based conversation over-air. The following screenshot shows PSK31 in use. 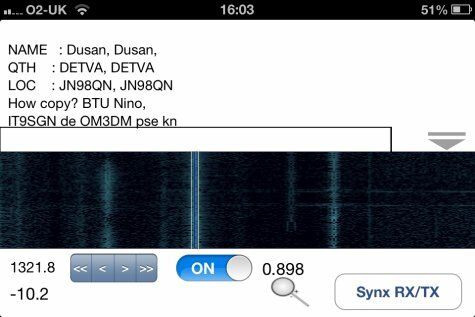 At the bottom of the screenshot is the “waterfall”, showing a number of different real-time QSOs taking place. Before you dive into the world of PSK31, have a try at listening and decoding some PSK31 signals. On our site, we have a tiny application called EssexPSK (written by Charlie M0PZT) that lets you decode PSK31 signals. It’s a receive-only program, but it’s tiny, easy-to-install, and free. To get started sending and receiving PSK31, you’ll need an HF rig, a computer, and a way to connect the two. Typically, this will be done using an interface, such as the one pictured below. This sits between the PC and the radio, and handles the audio, tuning the radio, and setting the radio into transmit. 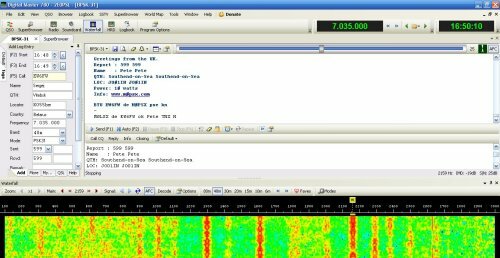 You’ll also need some software, and the application of choice for many is Digital Master 780, which is included as part of Ham Radio Deluxe. 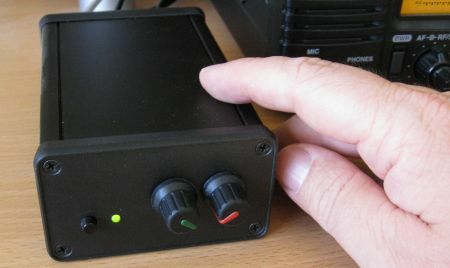 The setup process involves connecting your computer to your HF radio, then setting up the software. I’ll be honest – this can be quite tricky, and there are plenty of other sites that help with this process, so we’re limiting this article to the basics. Ideally, when everything is set up, your computer will display a waterfall showing QSOs, and you can send CQs and reply to messages from your computer keyboard. Life is made a lot easier with macros, meaning you don’t have to type out messages longhand. There are two main views – one for viewing incoming messages, and one for typing messages. The most common view is the “waterfall” view, where you can see existing conversations and CQ calls. From here, you can decide which amateurs to chat to. If there’s any demand, we’d be happy to extend this entry with more details on how to use PSK31. At the moment, we’re keeping it simple with this basic introduction. There’s a great free service that lets you see how far out your PSK31 CQ messages are reaching. Go to the website pskreporter.info and you can get information on who’s using PSK31. This works by using people’s computers to report which stations they’re able to receive. Put in your callsign to see which Internet-enabled computers around the world were able to get your signal. If you have a smartphone, you can try out PSK31 without having to connect your radio to a computer. It’s a simple case of installing an app, and holding the phone’s microphone to your HF rig’s speaker. Anything you want to know about PSK31? Please add a comment below and we’ll try to help. Yes, you can use PSK31 on HRD’s DM780. That’s how I use it, and it works a treat. The article and screenshots were created using DM780. If you have any questions, we’ll try to help. Using HRD 5.11 with DM 780 5.11 and ICOM 7600 connected with USB, I can’t transmit on PSK31 mode from DM780. The transceiver goes on transmit mode but without any power. Transmit Key is present and works properly but no HF power as if PSK modulation doesn’t work on transmitter input. Everything working properly in PSK mode using keyboard directly on IC7600. I down loaded psk 31 on my laptop. I can not figure how to send. I hooked up a cable from the laptop to my radio nothing happens . I m useing us link .